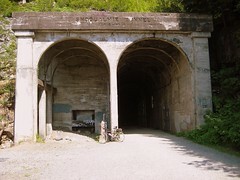 On an overnight bike trip to the John Wayne Pioneer Trail last weekend, my biking buddy and I discovered that the newly reopened Snoqualmie Tunnel is drawing a lot of visitors. Mostly they're day-trippers on bicycles, but some come by foot and at least a couple packed in with their llamas carrying their burdens. The cyclists we talked with were taking advantage of the 18-mile downhill slope that greets them after they pass through the tunnel heading west. Falling debris hazards in five John Wayne Pioneer Trail tunnels, including the 2.3-mile-long Snoqualmie Pass Tunnel at left, have convinced Washington state parks to close them until further notice. The closures are bad news for the many bicyclists and hikers who pass through the tunnels at they hike and bike the 100-mile-long rail-trail over the Cascades from Cedar Falls to the Columbia River. 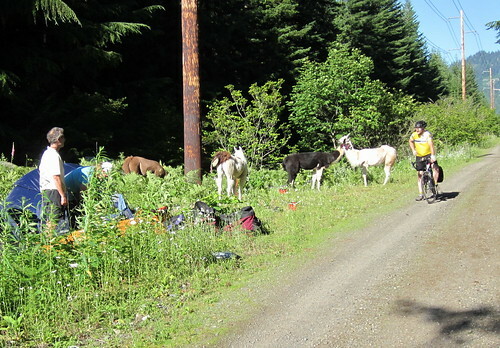 Shutting down the tunnels not only removes interesting historical landmarks from the Iron Horse State Park, which contains the rail-trail, but requires trail users to take long detours — sometimes out to Interstate 90 — to get through the remote area. I had heard about bicycling the John Wayne Pioneer Trail and the Snoqualmie Tunnel ever since moving here in 2000, but I didn't have the right bike until this spring. With a day to myself, I threw the knobbies on my Rockhopper mountain bike and drove up to the Cedar Falls (exit 32 on I-90) trailhead to find out about it for myself. Briefly, it was a great bike ride, and I can't wait to return with my camping gear. I rode the first leg of about 22 miles to the next trailhead at Hyak on the other side of the 2.3-mile long Snoqualmie Tunnel, looked around, and returned. I was shooting photos with my Canon Elph, and made a spur-of-the-moment decision to try a video. It appears at left.